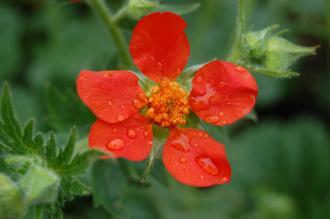 Geum coccineum is a fast growing, clump forming semi-evergreen herbaceous perennial. Its mid green leaves are imparipinnate with dentate margins, opposite, pleated, deeply veined and up to 5cm across. Its red/ orange flowers are five petaled, arranged in cymes and are up to 25mm across. Geum coccineum, commonly known as Scarlet Avens, is native to south east Europe, the Balkan Mountains. These plants inhabit a wide range of places such as dry open fields, bog and alpine regions. The etymological root of the binomial name Geum is derived from the Greek geuo ’to give an agreeable flavour’, referring to the roots of some species being aromatic. Coccineum is from the Latin meaning ‘dyed scarlet’, in reference to the flower color. The landscape architect may find Geum coccineum useful as part of a herbaceous ground cover mix, including in shady locations. Ecologically, G. coccineum is attractive to butterflies and pollinating insects. G. coccineum prefers moist, fertile, well-drained soils. It tolerates most pH of soil. 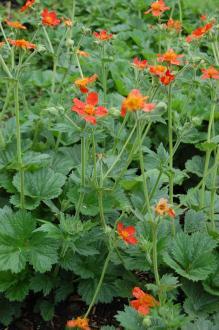 Geum coccineum requires little maintenance. Large clumps may be divided in early spring or late autumn.